Why Go To Church When I Can Just Pray At Home? 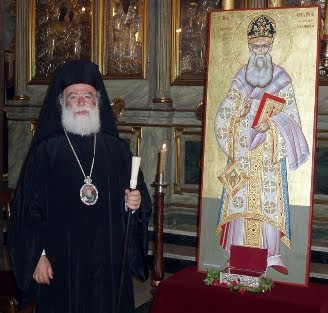 Milos To Be Consecrated A "Sacred Island"
In June of 2009 the Holy Synod of the Alexandrian Patriarchate declared Hieromartyr Cyril Lucaris (Kyrillos Loukaris) a Saint of the Orthodox Church. His memory is celebrated annually on June 27th. On 27 June 2011 Patriarch Theodoros of Alexandria and All Africa celebrated the Divine Liturgy in his honor at the Patriarchal Church of Saint Savvas the Sanctified in Alexandria. 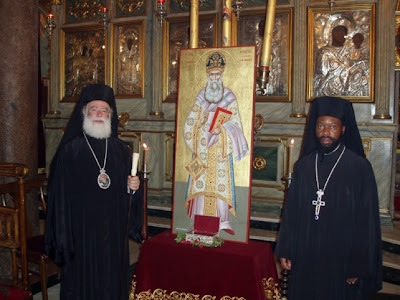 To read more about St. Cyril Loukaris, a short life can be read on the official site of the Ecumenical Patriarchate here. For a short clarification regarding the controversy over St. Cyril Lukaris, read The Myth of the "Calvinist Patriarch".